Nepal Police Club (NPC) clinched five gold medals on the first day of the judo tournament under the eighth National Games in Nepalgunj on Sunday. Manita Pradhan Shrestha, Nisha Chaudhary, Umer Magar, Indra Bahadur Shrestha and Rajan Joshi struck gold medal for NPC. Manita beat Kabita Nepali of Province 3 in the women’s below 57-kg division final. 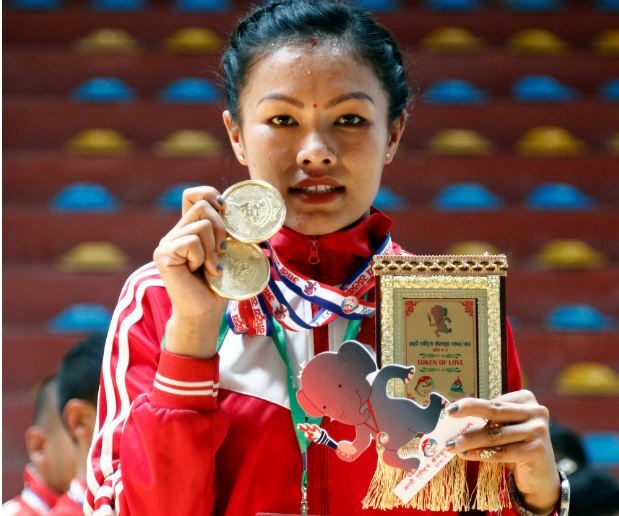 Devi Maya Shrestha of Province 3 and Sumi Thapa of Gandaki shared the bronze medals. Chaudhary won the women’s below 70kg division title defeating Binita Magar Khatri of Army in the final. Ranjana Khadka of Province 3 and Rachana Shrestha of Army finished joint third. Magar bagged the men’s below 60kg division gold medal after seeing off the challenge from Karma Tamang of Army club. Mohan Bam of NRN and Sudesh Dong of NPC claimed joint bronze medal. Indra beat Sunil Nagarkoti of Province 3 in the men’s below 66kg division title match. Joshi bagged the men’s above 100kg division gold, defeating Pranit Singh Thakuri in the final. Soniya Bhatta broke the stranglehold of departmental teams by clinched the women’s below 48kg division gold medal. Bhatta beat Dhana Devi Rokaya of Nepal APF Club in the final. Sarada Kumari Khatri of Province 5 and Ratna Tamang of NPC finished joint third. Pawan Kumar Shrestha handed the Army club the men’s 81kg division title as the judoka beat Lelil Dangol of APF in the title match. APF claimed the men’s and women’s doubles tennis gold medals at the Devinagar court in Butwal on Sunday. APF duo Ivanhoe Lissanevitch and Jitendra Pariyar won the men’s doubles title while Aslesha Lissanevitch and Saloni Tamang grabbed the women’s doubles title. Lissanevitch and Pariyar registered a 6-2, 6-4 win over Pradip Khadka and Nabin Magar of Province 4 in the final. Aslesha and Saloni thumped Prerana Koirala and Anne Mathema 6-1, 6-2 in the women’s doubles title showdown. Abhilasha Bista and Ira Rawat of Tribhuvan Army Club and Province 4 team of Shreya Bhattarai and Rojita Buddhacharya finished joint third. Samrakchhyan Bhusan Bajracharya of Non Residential Nepali Association and Pranab Khanal of Army entered the men’s singles final. Bajracharya eased past Santosh Khatri of APF 6-0, 6-3 and Khanal overcome Pradip Khadka of Province 4 6-3, 7-5 in the semi-finals. Abhilasha Bista of Army advanced to the women’s singles final defeating Rayana Shah of Province 3 6-2, 6-0. Bista will take on Prerana Koirala of APF, who beat Ira Rawat of Army 6-0, 5-7, 6-2 in the super tie-breaker, in the gold medal match. The finals are slated for Monday. In men’s hockey, NPC defeated defending champions Tribhuvan Army Club 2-1 to enter the semi-finals as Group ‘A’ winners in Nepalgunj. Manoj Chaudhary and Sagar Acharya scored for NPC, who were competing in hockey for the first time. Dipendra Aire was on target for defending champions. Sudhurpaschim Province also advanced to the semi-finals from Group ‘B’ as runners-up after they edged Province 1 3-1. Dipak Raj Joshi scored twice for Sudhurpaschim and Sumit Kumar Kami added another goal. Manish Magar replied for Province 1. Gandaki Province saw off Province 3 2-0. Prem BK and Pradip Nepali were on targets for Gandaki. Province 5 has already entered semi-final from the group. final. Farwest beat Province 2. APF beat Province 5 and will play Province 1, who saw off Gandaki Province, in another semi-finals. Province 5 beat Province 1 27-24 in the women’s basketball tournament in Ghorahi. In other league matches, Province 3 thumped Sudhurpaschim 57-33 on the back of 17 points from Sadina Shrestha. Anusha Lama contributed 16 points for NPC as the departmental team saw off Gandaki 68-43. Army overcome APF 44-37 riding on nine points of Mina Gurung. The men’s basketball saw Province 5 crush Province 6 67-28 after Rohit Baral contributed 23 points. Gandaki, Province 3 and Province 1 also won their games. Gandaki recorded a 104-29 win over Province 2, Province 3 edged NP 77-66 and Province 1 defeated Sudhurpaschim 70-40. Meanwhile, Krishna Thapa of Gandaki defeated Bipana Blon in women’s singles match to record fourth league win in squash tournament at the Satdobato court in Lalitpur. Bhawana Sunwar is the only other player to win four matches in the event contested by six players. The match between Thapa and Sunwar to be held on Monday will determine the champion.